A fine selection of good tunes, released under the title of an imaginary world, in which 56 Stuff deems appropriate to use some business marketing tools. We decided to have fun in a slightly weird way and imagine how things would be if we use business marketing practices in our activities. Of course, this does not affect our first  and the most important  step: as usual, we start by selecting a number of music tracks that we really like. Only after that, the weird fun begins. Experienced and sly marketing consultants prepare research for us and get ready themselves to present it properly  using various kinds of pie-charts, graphs and diagrams. We then discuss the best way of discussing the gathered data. Throwing away the ideas of a conference call and a golf-playing briefing session, we set up a meeting in a rented conference room with glass walls, a flip chart and a plasma panel. Marketing experts deliver a half an hour speech that makes no sense, but includes some impressive moments. They say things that sound pretty clever: impulse purchase, unique selling proposition, commodity life-cycle, sales funnel, etc. While we are trying to figure out what to do with this, marketing people convince us to work with a focus group. Thus, an ordinary housewife with average preferences in whatever-she-prefers takes the stage. She is the queen of target audiences. She is the essence of consumers’ taste. Moreover, she loves spending her spare time exchanging opinions with peers. The fun continues: we take our seats behind a one-way mirror and watch how interchangeable groups of housewives become acquainted with our music compilation. Assistants ask women to listen to a product, then discuss the product and finally, describe the product in their own words. This trial lasts way too long. After a couple of hours we become bored and are ready to accept any possible results whatsoever. By the end of the day, we are simply happy to go home. Some time later, we find ourselves once more in a fancy conference room  where marketing people show us the final presentation. 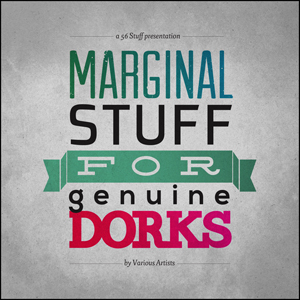 With the reference to the focus group research, they state that the best solution for us is to adopt the title Marginal Stuff for Genuine Dorks. Since they are professionals, they must know what they do. After all, they are paid so well, therefore they can’t be wrong, right? Spotify, Deezer, 7Digital, iTunes, Google Play and Juno.